Transform any regular desk into a fully functional sit and stand desk easily, with our amazing Epic Riser Standing Desk. 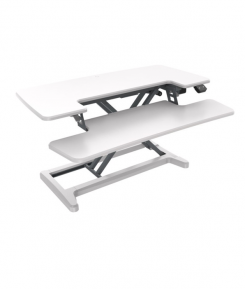 With its durable E1 rated 25mm melamine workstation plus keyboard surface, and strong steel adjustment support beams, this riser is made to last. Also, its gas spring lift offers exceptionally smooth and even height adjustment. So invest in your workplace health today, with the Epic Riser Standing Desk.